Every week you will have an assigned homework/task to complete. These assignments are designed to help create the best Kickstarter campaign for you! 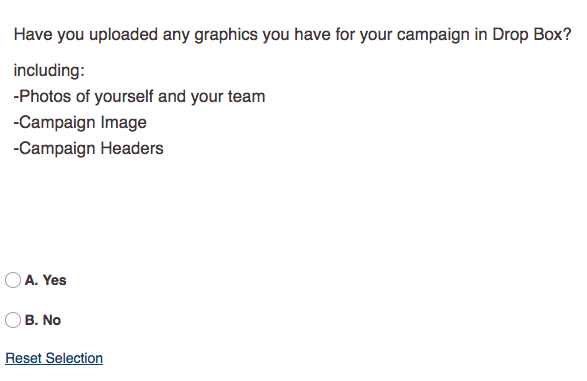 In order for your campaign to have the best chance of funding, it is important to make sure you follow the steps for each week’s homework. Most of these assignments consist of different parts. Please use the Drop Box when you need to upload files for homework. Everything will be outlined and explained in the videos you have to watch each week. It is important to watch these videos in full and maybe even take notes to make the homework easier to accomplish! Sign into the course website. 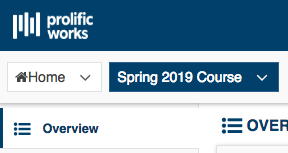 Make sure you are on the “Spring 2019 Course” tab. It should be blue. 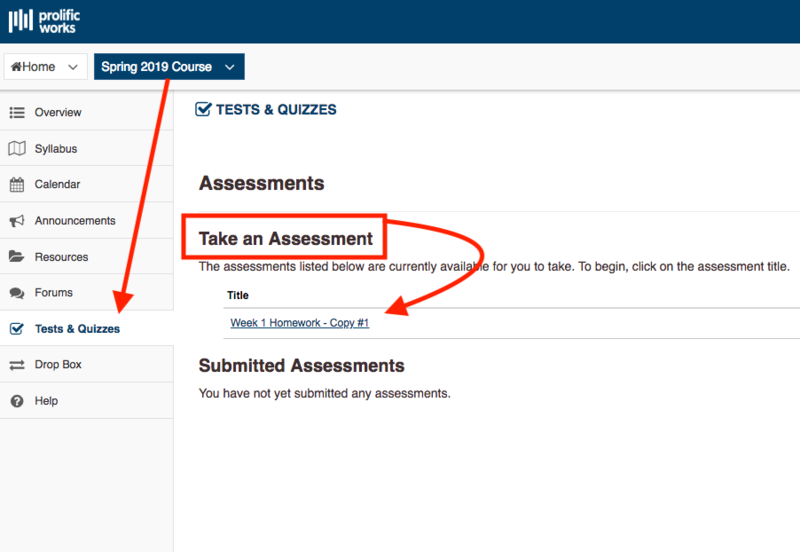 To access homework assignments, select “Tests & Quizzes” from the left side panel. 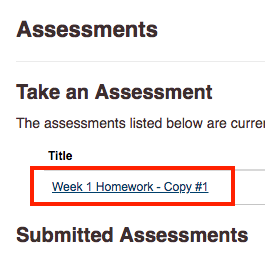 When you click on this, you will have a list of homeworks that are available to you under “Assessments”. When a new homework becomes available, this list will update automatically. a. Take note of the due date of the homework! Make sure to get your work in before it is due. All homeworks are due a week after they are assigned/available. Select the correct week’s homework by clicking on its name. When you select a homework assignment, you will see a blue box containing information. This information will list all of the things you should have accomplished by the end of the week or when you submit the homework. Note: The due date of the homework is written below the week’s tasks. Note: You will not be receiving a valid score for your homeworks. Prolific Works staff will be reviewing your homework every week and sending you comments on improvement. Homework assignments can be resubmitted for when you need to make corrections. When you are ready to submit all the tasks, click “Begin Assessment”. a. There are different types of questions. Some are multiple choice, some are short answer, and some require you to upload a file or video. Note: You will use Drop Box to upload homework files. b. You might find examples below a question to help you. IMPORTANT: After you fill in your answer, choose “Show feedback” before clicking Next to move on. You should do this for every question. Feedback will appear below the answer option. If you have not completed a task, the feedback will give you links and comments from the Prolific Works staff to help you complete a task. a. If the feedback requests you to complete a task, do so before continuing on. When you finish answering all the questions, select “Submit for Grading”. If you are not ready to submit, you can click Save and Exit. You can return to the assessment later on when you are ready. Note: Make sure to Save before you Exit or else your work will be deleted! A submission warning will appear on the next page. You can either confirm submission or go back to the homework. When you confirm submission, you will see a receipt which will also be emailed to you. This confirms that your homework was sent in and we can look it over! 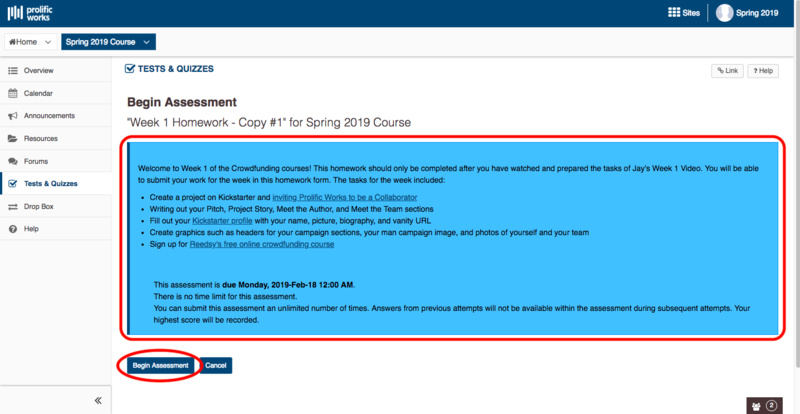 You can review past assignments by looking under the Submitted Assessments section and clicking “Feedback” for the homework you would like to review. In the feedback you will also be able to see comments that the Prolific Works staff leaves for you. Comments can be left on the general assessment or on individual questions, so make sure to check all. Sometimes you will have to upload files for homework. Some questions on the homewrk will ask if you have uploaded the required files to Drop Box. The files you upload will only be visible to you and the Prolific Works staff. Other students cannot see your work. Here is an example of what one of these questions might looks like. When you reach one of these questions and you have already uploaded the required files, you will select “Yes”. If you have not uploaded the files, you can Save and Exit the homework. a. 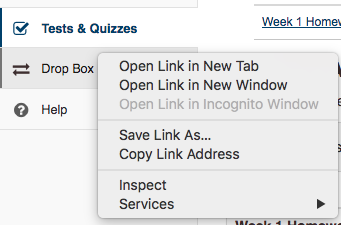 If you do not want to leave the homework page you can right click on the “Drop Box” tab on the right and select “Open in new tab”. i. This will keep the homework open and open the Drop Box in a separate tab so you can go back and forth. b. Warning: If you do not save your homework before exiting, you will lose all the work you have already submitted! Once you have saved and exited the homework assignment, click on “Drop Box” below the “Tests & Quizzes” tab on the right-side panel. On the Drop Box screen, you should see your information as: Last Name, First Name (email). Click on the blue “Actions” button. From the drop down menu select “Create Folders”. Make the folder title according to the week. a. Note: To make future homeworks easier, create the folders for every week now so you can go straight to uploading in the future. b. You should create 5 folders for each week. After creating the folders, you will be brought back to the Drop Box page. You should now see all the folders you just created. Open the folder you created for the week by clicking the name of the folder. 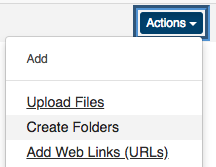 On the folder page, click the blue “Actions” button and select “Upload Files”. The “Upload Files” page will open. 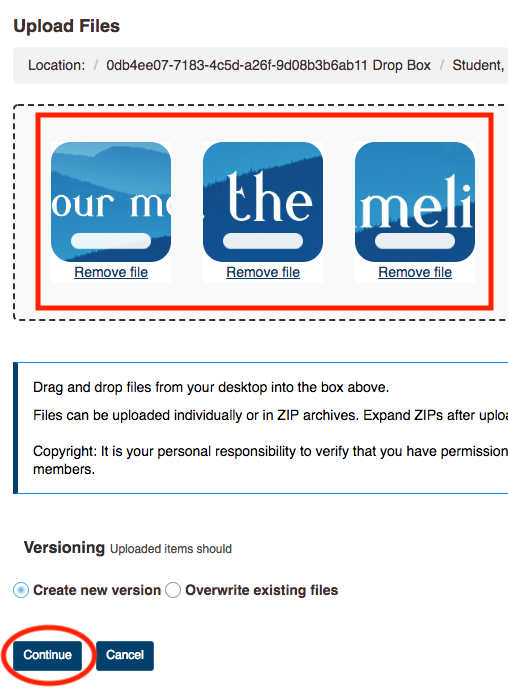 Click on the blue “Drop files to upload, or click here to browse.” button. Select the file you would like to upload. You can choose any file type including doc, pdf, jpg, png, or video files like mp4. The files you select will appear in the box where the blue button was. Click Continue when you are finished selecting your files and they will upload. You will be brought back to the folder you uploaded to and you should see your files below the folder name. 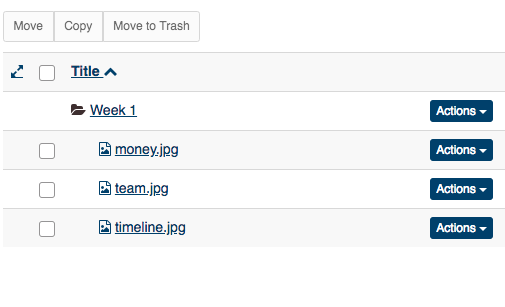 If you accidentally upload the wrong file, click on the blue “Actions” button next to the file you want to delete and select “Move to Trash” from the drop down. Please note that Drop Box cannot upload more than 20 MB of material at once. If you have more files that you need to upload but run into an error or cannot upload all the files you need to, just repeat steps 12-17 and upload your files in clusters. If you would like to link to a youtube video, Google doc, or Google sheet, click on the blue “Actions” button and select “Add Web Links (URLs)”. Put the URL in the Web Address space and in the space for Website Name, put what the link is (ex: Campaign Video, Marketing Spreadsheet, Campaign Updates). a. IMPORTANT: Before adding a link, make sure the link is visible to the public! We won’t be able to see things like a Google Doc or Youtube video if the settings for the link are set to private. 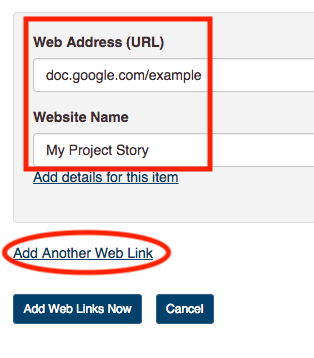 You can add other links by clicking “Add Another Web Link”. 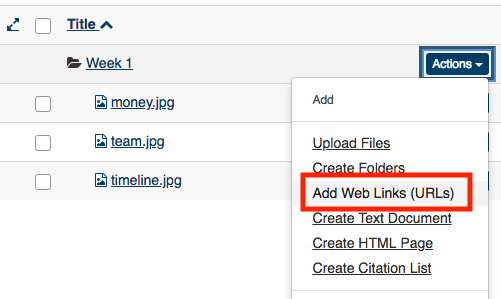 When you are finished adding links, click the blue “Add Web Links Now” button. You will be brought back to the folder page and your link should be there under what you put in the “Website Name”. You can test the link by clicking on the link title. On the main Drop Box page, you can see whether or not you have items in the folder if the little folder icon next to the folder name is clear or gray. Gray means there are items in it. The Prolific Works staff can view the items in your Drop Box and provide you with feedback. 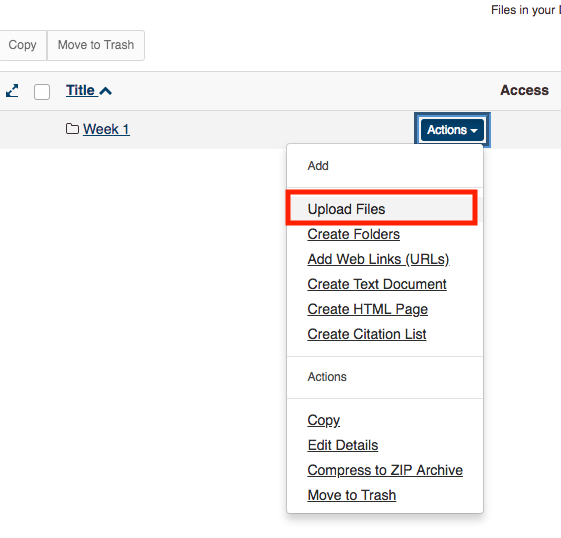 When you have finished uploading the week’s files, go back to the homework and make sure you select “Yes” when asked if you have uploaded files to Drop Box. a. 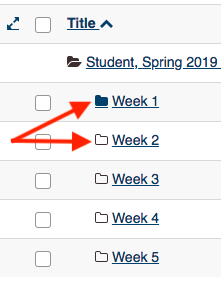 If you chose to Save and Exit your homework to go to the Drop Box, you can click on the “Test & Quizzes” tab and select the incomplete homework. b. Click the blue “Continue Assessment” button. 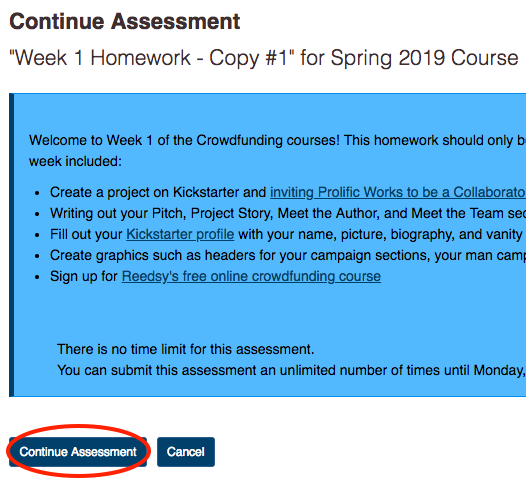 c. You can navigate and jump around homework questions with the “Question Progress” panel on the left side of the screen. i. Make sure all the circles next to the question numbers are black before you submit for grading. This means they are answered. Congratulations! You can now submit your homework assignments successfully!